Squash House Quilts: Sunny California! Mr. Squash and I are in sunny Napa. It is so nice to get away from the cold and frozen fog of our town for a bit! We arrived today (we drove) and will be here until the middle of next week. On our way down the highway yesterday we were met by this awesome view of Mt. 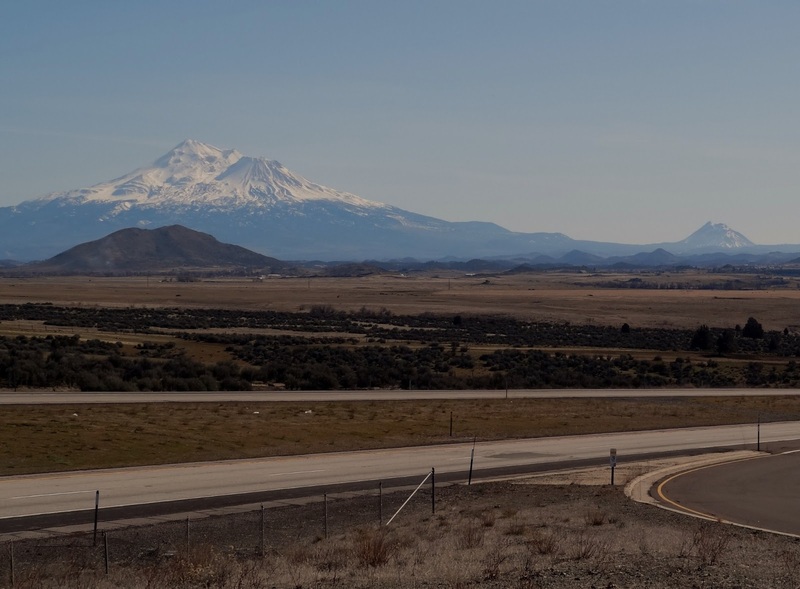 Shasta and Vista Point. I had to pull over to get a photo. I am amazed I managed to get one without a semi rolling down past it - they are everywhere! The mountain got larger and larger as we rolled down the road. I had to pull over again to get this great photo. Suprisingly we ran into no snow on the road anywhere - even going over the Siskyou's! So far we're charmed travelers. We're staying with our friend Robert in Napa. He has a wonderful home with a view of the wetlands out his back door. And for those of you who don't believe men iron - here you go! Thank goodness Robert is a good sport! Tomorrow we plan to go to the CIA's restaurant for lunch (Mr. Squash fondly remembers a dish of Sand Dab he had there many years ago) and tomorrow evening we are going to a Crab Feed at the Cattlemen's Assn! After that we plan to tour around the valley and see the sights. One day there might even be a blog-friend meeting! Stay tuned! Beautiful images of the mountains. Have fun in California! 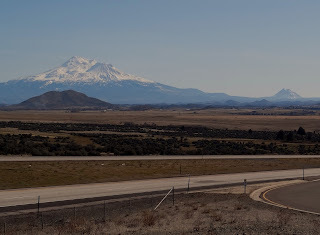 Beautiful Mt Shasta, your making me homesick. We lived 50 milles from Mt Shasta in Northern California mountains along Hat Creek. Great fly fishing there. Have a wonderful vacation and enoy the weather. I love snow capped mountains and that is a pristine photo. Sounds like Napa will be a food fest. Have fun. Oh, I'm so envious of your visit to Napa. Haven't been there in many years. Do sample a few for me, okay? Perhaps a good merlot? Have fun and enjoy your visit. Cool photos of the mountains!!! Beautiful! Have a wonderful trip! Have a great time in Napa.....a beautiful area. Hope to see you soon.....maybe??? Gorgeous photos! I'm so jealous! Wow - what beautiful pictures of the mountain. Enjoy the view! Wave hi to my sister! she lives on Old Vine Way, lol. Be sure to visit the winery called Castella de la Rosa...a must see and lunch at the Rutherford Grill is a must!!! have a great trip. that mountain is awesome. I seem to remember seeing it when I was child. Did you see my waving at you from my deck? I can see Mt. Shasta from my deck. I am working in Redding which you will drive through on your way home. Have a great trip the weather has been absolutely beautiful, but that is about to change I hear. Hope you get home by then! 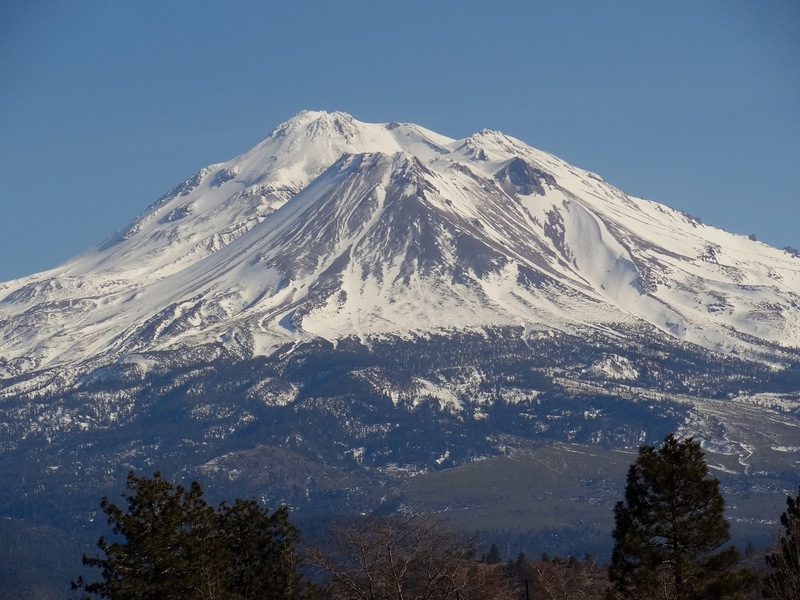 Shasta is beautiful if you are passing through Weed. I am itching to make a road trip to Oregon one of these days. I really should. I haven't been up in about 4 years.